Would You Like To Go To A Doctor With A Medical Degree From UVI? Take Two Aspirin and Call Us In Six Years! CHARLOTTE AMALIE — The University of the Virgin Islands held a groundbreaking ceremony Wednesday to commemorate the start of the construction of the University’s medical facilities. Virgin Islands leaders, UVI administrators, faculty, staff and the medical community attended the Medical School Classroom Building groundbreaking on March 2, on the St. Thomas Campus, which is the first of two ceremonies scheduled. A similar ceremony will be held for the Medical School Simulation Center today on the Albert A. Sheen Campus on St. Croix. Senate President Neville James and other members of the 31st Legislature attended Wednesday’s ceremony. “You measure risk by the size of the reward,” said Sen. James, who encouraged others in the community to support the SOM, which is expected to be the first accredited English speaking school in the Caribbean. UVI Board Chairman Henry Smock and James Tunick, vice chairman for the Board of the Foundation of the University of the Virgin Islands, attended today’s ceremony and spoke in support of the endeavor. “Having an accredited Medical School in the Virgin Islands is going to truly be a game changer,” said Tunick. Medical, academic and Virgin Islands community leaders donned hardhats and held shovels to commemorate the start of construction for the SOM, but also took turns pounding a stake in the ground, to symbolize the faith and commitment that UVI has placed in the fertile soil and soul of the University. 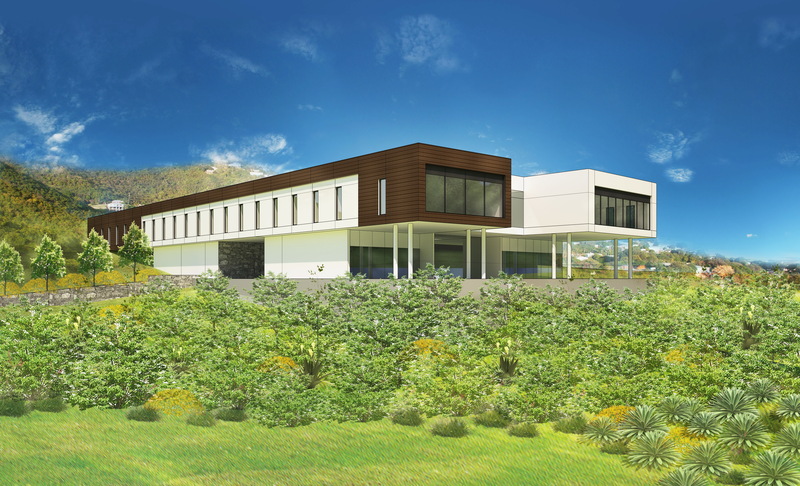 “This Classroom Building on St. Thomas and the Simulation Center on St. Croix are stakes in the ground of our future which when realized will improve the quality of health care and create more economic prosperity for the people of the Virgin Islands,” said Dr. Hall. Dr. Sachs introduced SOM faculty, staff and administrators at the ceremony. Dr. Gwen Moolenaar will serve as an associate dean in the SOM. Dr. Moolenaar, former UVI provost, vice president of Institutional Advancement and Sponsored Programs, is the first black woman in the United States to earn a doctorate in neurophysiology from Indiana University in 1972. She earned a Bachelor of Arts degree in biology from the College of Saint Elizabeth in 1962 and was awarded a teaching fellowship at Long Island University, from which she received a Master of Arts Degree in biology in 1967. Victor Santiago, FirstBank Eastern Caribbean Region Business director, announced the development of the FirstBank Cares Scholarship Fund for local students. The fund will award a $32,000 scholarship for one year of full-time study with the option of renewal for $128,000 over a four year period. 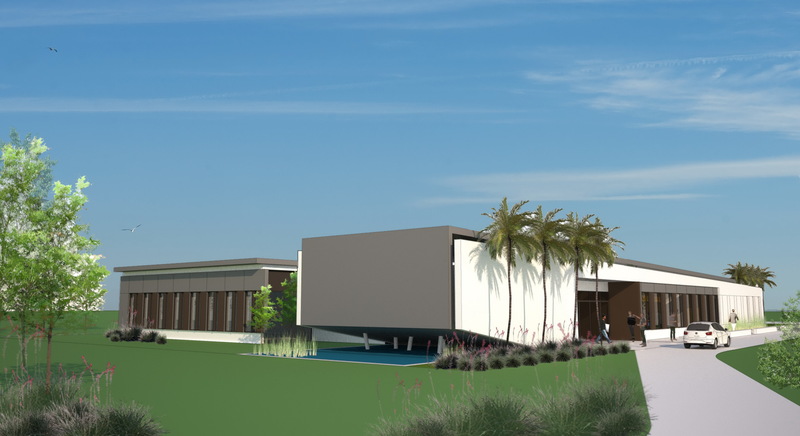 The UVI Medical School Classroom Building will be situated adjacent to the Eastern Caribbean Center, overlooking the Herman E. Moore Golf Course, located on the St. Thomas Campus. The over 33,000 square foot, two-story building, will house seminar rooms, a 100-seat lecture hall, library, anatomy/physiology and clinical skill labs, and administration space. Classrooms, lecture halls, conference rooms and seminar rooms will feature smart classroom technology. The anatomy lab will feature a Anatomage Table for anatomy education using technologically advanced visualization. The Anatomage Table is sufficient to cover the full anatomy class. High accuracy and rich contents offer an excellent replacement to traditional cadaver based dissection. Since the data preserves the real life patient color and shape, the table is more effective than embalmed cadavers. The building’s contemporary design will utilize traditional native stone and cypress wood found throughout the campus, paying homage to the history of the university, while looking to the future. Construction is expected to be completed in March 2017. The Medical School Simulation Center will be constructed just past the main entrance at the northern end of the Sheen Campus. The one-story 21,332 square foot structure, will consist of surgical skills labs, simulation rooms, a 70-seat lecture hall, conference space, a dining hall and administrative offices. These state-of-the art spaces will provide an active learning environment for medical students and visiting physicians. The conference room and lecture hall will feature Smart Classroom Technology. Traditional native stone and cypress wood create a unique identity for the building and a University-wide language that ties the campuses together. These physicians will help to improve the level of care in the territory and have a significant economic impact, he said. According to a May 2015 SOM Economic Impact Study, the annual economic impact of the UVI School of Medicine’s Simulation Center, when fully operational, will be approximately $30 million. The SOM Classroom Building will have an economic impact of an estimated $30 million. Sachs is excited about the possibility that UVI, as a Historically Black College and University (HBCU), will establish a medical school outside of the mainland Unites States. Of the 106 HBCUs in the U.S. only three have medical schools. The UVI SOM would be the first new HBCU medical school in over three decades. The vision of the UVI SOM is to improve the health care of the people of the territory and wider Caribbean community and to address pressing national and international health issues in support of the global community. The SOM will adopt a proven curriculum and assessment tool through a collaboration agreement with the University of Central Florida. On Oct. 13, 2015 the Liaison Committee for Medical Education (LCME) Advisory Board voted not to grant preliminary accreditation to the UVI SOM. The UVI Board of trustees decided on Dec. 8, that the University would reapply to the LCME for preliminary accreditation status for the UVI School of Medicine. UVI will reapply in August of 2016. The UVI SOM’s goal is to open in 2017. The SOM has received support from Gov. Kenneth Mapp, the VI Senate, the LCME, FirstBank VI, the Foundation of the University of the Virgin Islands (FUVI), the Historically Black Colleges and University’s Loan Program, and Dr. Chirinjeev Kathuria, who pledged a $30 Million gift to the SOM.